David Subacchi, and Bob Ward. Welcome to Amsterdam Quarterly’s original website. AQ was founded in April 2011 and its goal is to publish, promote and comment on writing and art in Amsterdam, the Netherlands and the world. We hope you enjoy reading the work selected for this twenty-fourth issue (AQ24) and we look forward to your comments at editor@amsterdamquarterly.org or submissions at submissions@amsterdamquarterly.org. In June 2019, in honour of our 25th issue, AQ’s theme will be Amsterdam (reading period April 2019). This is the time to send AQ work about your inspiring visits to Amsterdam’s museums, concert halls, the Red Light District, coffeeshops, the Vondelpark, etc. 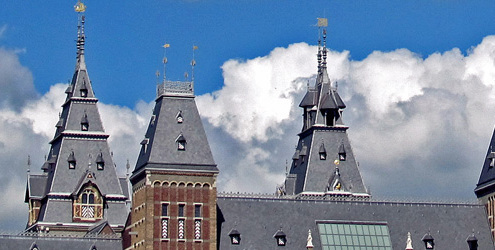 Send us your work about how Amsterdam has welcomed, entertained, inspired and/or revived you. To complete the year, AQ26’s theme will be Borderlands (reading period July 2019). Send us your work about living on or near the border of two countries or cultures or about how, why or when you feel like a grensgeval, living on the edge. AQ is especially interested in short stories, drama, photography and art related to this theme. 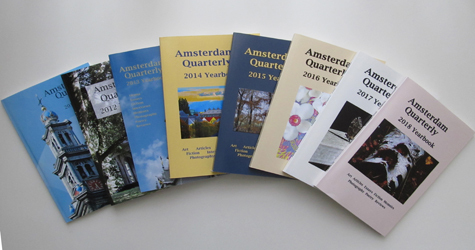 Amsterdam Quarterly’s twenty-fourth issue brought in work in seven different genres about media. Unfortunately, AQ could only publish a few pieces on books, drawings, newspapers, telephones, mobiles, photos and photographers, and TV news and programmes. Headlining AQ24 is a photo essay by Ladislav R. Hanka about his collaborative art made with honeybees. There is photography by Jury S. Judge and Bob Ward, an essay by John Talbird, fiction by Nancy Ludmerer, a memoir about visual artist Dawn Clements by Bryan R. Monte, and book reviews of Jacob M. Appel’s Amazing Things Are Happening Here, Jean Huet’s With Walt Whitman: Himself and Scott T. Starbuck’s Carbonfish Blues: Ecopoems (with artwork by Guy Denning). As always, there is a generous portion of poetry in a variety of styles and formats by James Broschart, Peter Neil Carroll, Margaret DeRitter, Diane Giardi, Martin John, Neil McCarthy, Ian C. Smith, Meryl Stratford, David Subacchi, and Bob Ward.